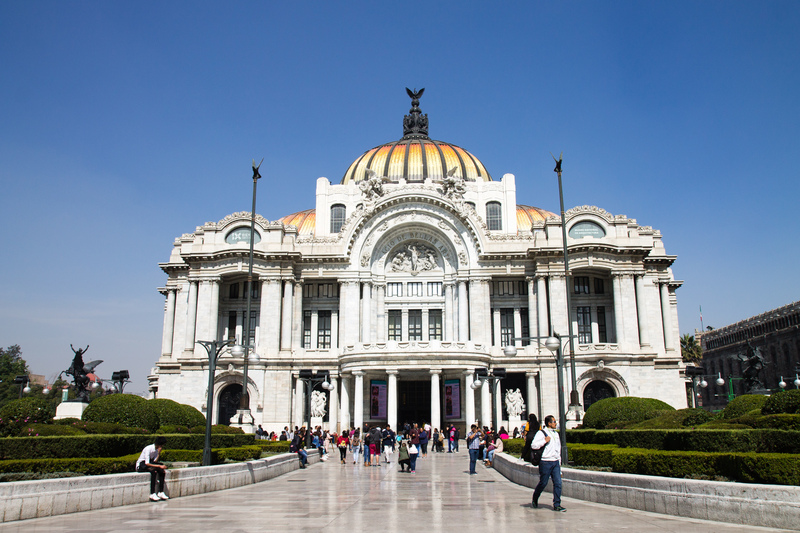 Mexico City is encompassed by land and air, by mountains, hills, volcanoes, and haze. But it cannot be encompassed by words. Or not by mine. I saw a fraction of this enormous city. But I do have impressions, and those I will share. With one of the three dogs who were our Mexico City flatmates. I had no idea, but there seemed to be almost as many dogs as people on the sidewalks of the La Condesa neighborhood and nearby. It seems half of the people must have dogs. Dog walkers strolled with packs of ten, or let them lounge together in one of the many parks. People briskly took their dogs on laps around the block. We sat in a park and watched a woman play fetch with her two Belgian Malinois until a group of eager children approached and took over the task of throwing from her. So many types of dogs, happy and healthy! And, in case you wonder: poop on the sidewalk wasn’t really an issue. The Mexican food one typically finds in the U.S. isn’t really the same. Try this: a quesadilla with quesillo, squash flower, and huitlachoche. Trust me, corn fungus does taste good. Get those chilaquiles for breakfast. Join the queue for one of the popular street stalls. Have churros and chocolate (the drink!) for dessert. Non-vegetarians can venture into the territory of eating chapulines, that’s grasshoppers. But really, try something new. Burritos are good, but there’s a world out there. 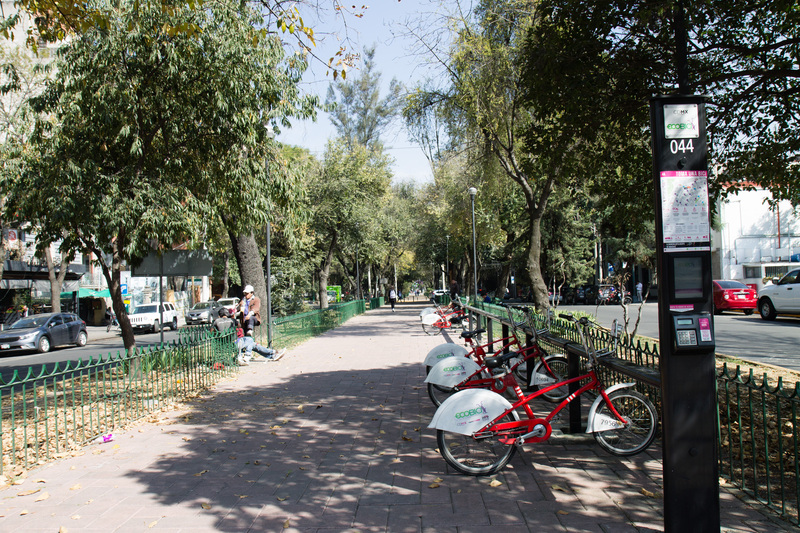 An Ecobici dock on a tree-lined street. Typical and lovely! For almost every dog I saw, there was a cyclist – and sometimes a cyclist with a dog jogging alongside. I was very impressed with the bicycle infrastructure in parts of Mexico City. Ecobici, the bike share program, seems to be commonly used, as I saw people cruising along on them all the time. I saw not just bike lanes, but protected bike lanes, what a dream! The bicycle infrastructure was better than in most U.S. cities I’ve lived in, and it was definitely being utilized. Though, bonus points for the guy I saw rollerblading down the highway, cigarette in hand, keeping up with the slow-moving traffic. There’s that option, too, it seems. 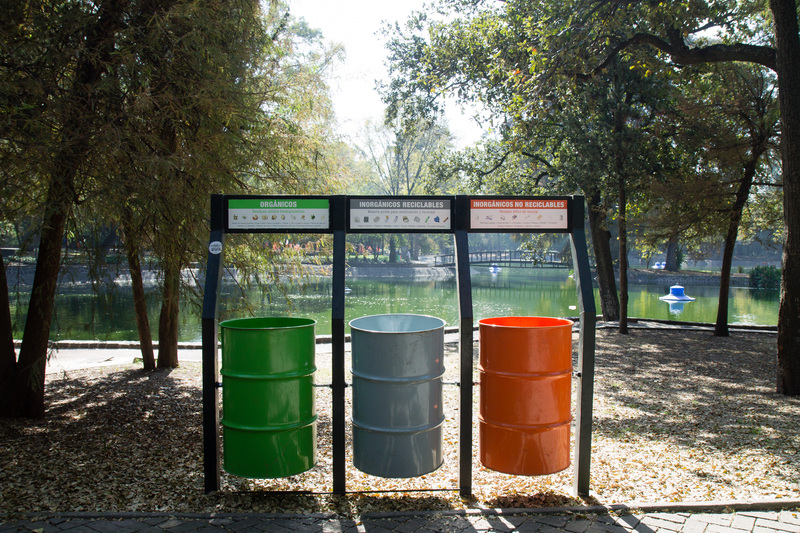 In Chapultepec. I was enthusiastic about the recycling and compost options on offer. The street we stayed on was lined with trees, and trees divided the lanes of traffic. Almost every three blocks it seemed as if you would come across a small park. And then there are the huge parks. 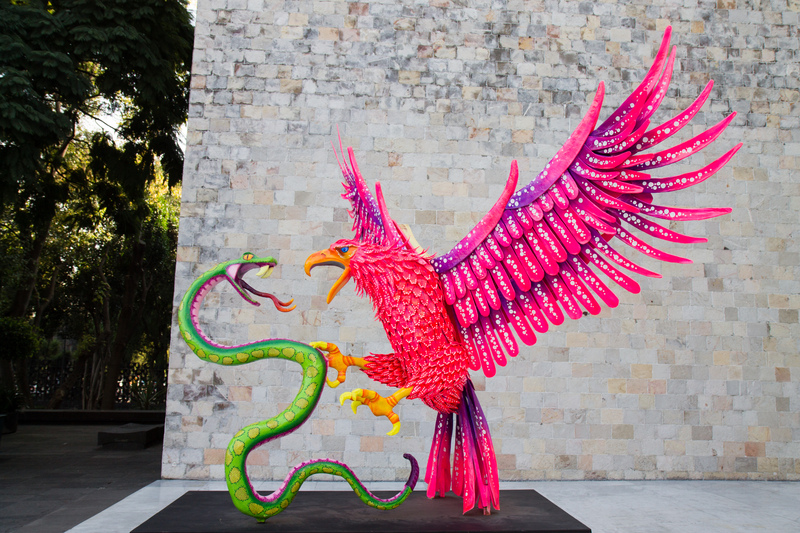 We spent some hours wandering in Chapultepec, the most iconic, which hosts museums and a zoo. 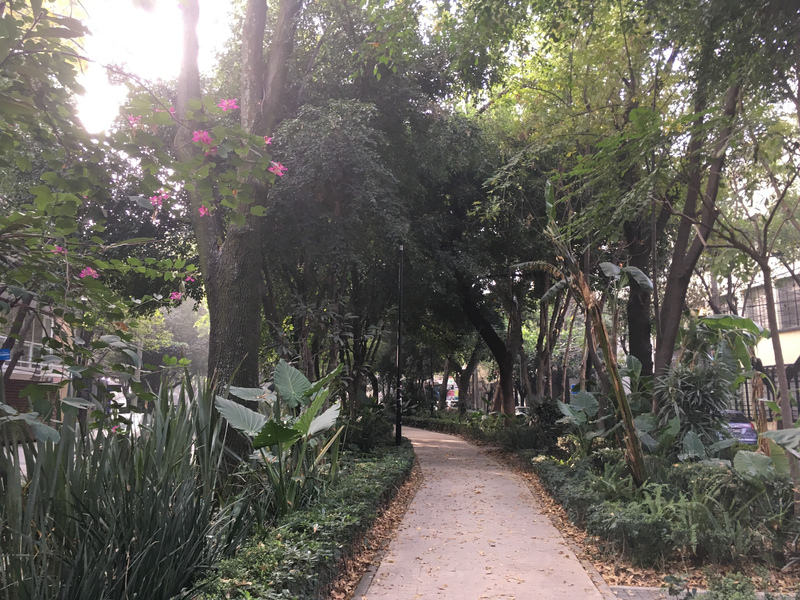 And we also walked all through Parque Viveros, surrounded by other strollers, and by runners, and by groups of yoga and martial arts practitioners, and by picnickers, and by, as my friend says, “impertinent squirrels.” But those greedy little squirrels! I would stick my empty hand out and they’d pull it down, peering over to see if I had any food for them. Green space is important, and dispersed green space in such a large city is a wonderful thing indeed. Mexico City has some wonderful architecture, but alongside the more grandiose buildings is the common and humble few-story apartment block or home, with a small balcony reaching out over the sidewalk. And there’s the second-story restaurants with their fresh air section, from which you can watch passers-by. Balconies are connections. There should be more balconies. Not a place to hang out on a balcony, but pretty nonetheless! Palacio de Bellas Artes. I can provide these snapshots, but the city is beyond what I want to try to frame. We didn’t have enough time in Mexico City (when is there enough time anywhere?) but we traversed many miles of it, across many neighborhoods. Before we went, we were warned, be careful, about Mexico in general, and about the big city in particular, by people who’ve never been. And indeed, we were the only obvious tourists we saw at our gate while waiting for our flight. So I want to say this too: don’t worry, and visit Mexico City! 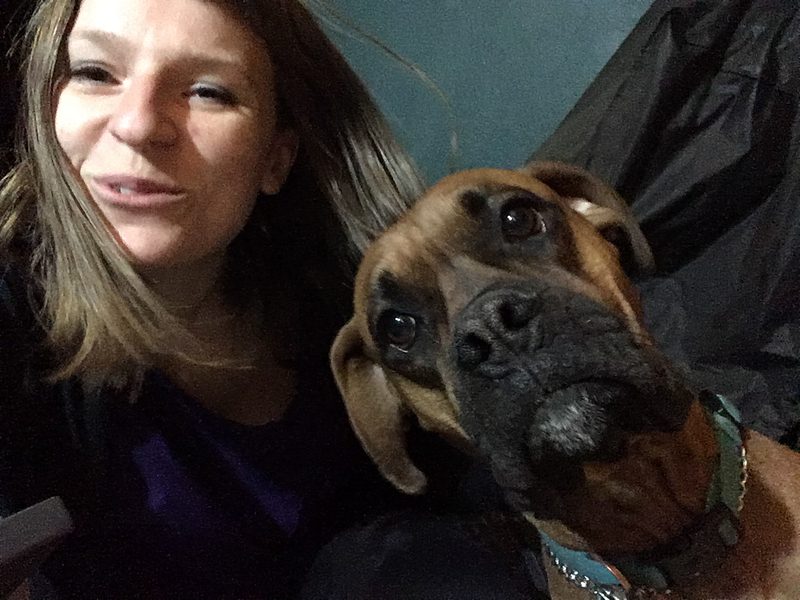 I felt safe – and went for a run by myself and saw other women doing the same. It’s a big city, but what you can say of it is what you can say of other big cities, for good and for bad. But mostly for good.